Okay, first let me define "homologous structures." Bears and humans both have five toes on their their feet (and hands, in the case of humans). This similar arrangement is called a "homologous structure." Such similarities are the study of comparative anatomy, which investigates the arrangements of various animals and tries to determine whether similar structures are a result of ancestry. One argument for evolution is that all vertebrate animals (animals with backbones--almost every kind of creature we think of as an animal in the common sense) appear to share the same basic bones in their skeletons. Even structures as diverse as bat wings and cougar legs appear to be variations of the same arm bones. Some animals, such as horses, have very unique limbs and digits. In the case of the horse, there are not five toes, but just one on each foot. However, the rear feet of modern horses have tiny extra toes hidden alongside the main toe bones. Furthermore, horses are sometimes born with three toes, and early fossil horses had up to five! Creationists explain these homologous features by suggesting a designer could have simply used the same basic "plan" when designing all the animals. Four legs, one upper arm bone, two lower arm bones and five fingers was just the blueprint used by the designer. The problem with this argument is that no real designer ever restricts themselves in this way. Imagine if airplane designers began every blueprint for airplanes with the frame of a car. And cars frames were simply enlarged, stretched out versions of bicycles, and so on back to wagons. This is simply not how designers work. This is how heredity works! You look like your parents because you're related to your parents. Animals share skeletal arrangements because they are related to one another. Again, human designers were not foolish enough to restrict themselves to a single template for their designs. Why would we expect a supernatural designer to do so? And if you say, "well some early car designs were based on wagons, and some rocket ships borrowed from aircraft designs," you are either missing the point or being disingenuous. Humans do sometimes borrow from other objects when they design something new, but we do not see a single template arbitrarily applied across the breadth of human designs. Again, vertebrate animals all share the very same template from fish to birds to humans. This is not a mark of design. How foolish. A human couldn't find a way to design a wide range of creations from the same template but a supernatural designer has the ability to use the same structures and templates. that just goes to show you that man thinks he is all mighty because he had to come up with entirely new pieces when a boat has to float or a plane has to fly. apply that to how a bat and whale can swim using the same template. So in conclusion if you aren't smart enough to make a car with airplane pieces don't say it can't be done. Well, I don't say it can't be done. Yes of course it could be done. But my point is it ISN'T done by human designers because it's NOT the best way! A single template is not an argument for design, it's an argument for shared ancestry. Animals look related because they ARE related. You might not call that proof, but it is strong evidence. And think about your logic: you're asking me to believe vertebrates were specially created because they DO share the same template and that would be hard to achieve if they were designed. That is circular reasoning. It's fine to say you believe a shared template was the designer's way of doing it, but it's not o.k. to say it proves anything. It's actually evidence that these unique animals are related. 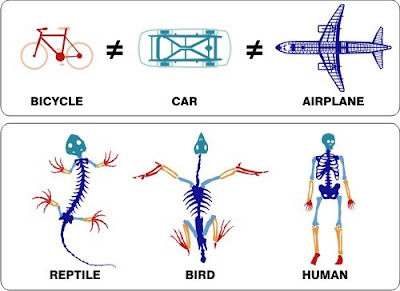 Again, no intelligent designer on earth starts with the same "skeletal" template for every type of vehicle. So everything we know about good design says this is not how it would be done. Imagine if things were turned around. Imagine if instead of similar-looking skeletons, animals had highly unique skeletons that were nothing alike. Imagine if every kind of vertebrate animal had highly specialized bones that didn't compare to other kinds of animals. Then I come along and say, "Actually, this proves animals evolved because a smart creator would restrict themselves to a single template." You would call me crazy! No intelligent designer arbitrarily restricts themselves to an inferior and limiting design framework. I'm an artist and today, after I read your entry, I realized something. I start my creations all the same ways. I build them the same, beginning with similar-looking features and structures, then change them as I finish the piece. Who's to say God didn't do the same? These creatures are all related because the same Creator made them, not because they evolved from a single organism. By the way, it is far more logical to believe in a Creator than it is to believe that everything just made itself randomly. Well once again it's possible that a designer would work this way, but this is not the way designers usually work. My post points out the inaccuracy of the creationist claim that homologous structures point to design. Think of it this way: You say you build your creations by starting with similar-looking features and structures and you change them. That's fine. You've chosen to limit yourself to working this way. But imagine I held a contest to design the best possible airplane, bicycle, and car. You submit your designs along with many other designers. While it's possible you might start with the same metal frame and simply bend it to shape for each one, the winning designs would almost certainly be unique for each vehicle. Most designers would not use the identical layouts to build the frames of each one of these vehicles. Again, this is what we see in designs all around us. There are exceptions, but by and large designers (unlike nature) can imagine ways to create customized structures for any given design. They don't base their designs on what other designs look like. They specialize them to come up with the best possible structure for a given application. As I said in an earlier comment, if animals in nature had totally different skeletons, it would be VERY hard for scientists to claim they were related. The argument for design would be strong. However, the reverse is the case in nature as we know it. What we find with biological structures (that they share basic forms) suggests they are related, not that they are unrelated. And to your second point: I agree that it's more logical to believe in a Creator than it is to believe that everything just made itself randomly. But this is not what evolution claims. If it was just random I wouldn't believe it myself, but it's not. It's so much more than randomness.